The Right Click Tools also have some requirements for the machines that they’re running against. ICMP echo must be enabled in the firewall, as well as remote WMI and File and Print sharing. Additionally, the user running the Right Click Tools must have sufficient permission on the computer that the action is running against to perform that action. If using the tools to reset passwords, unlock accounts, or change group memberships, the user must have permissions to perform these actions in Active Directory. Some of the tools use the Remote Registry service, so this service must be enabled on both the device running the Right Click Tools as well as the device being connected to. 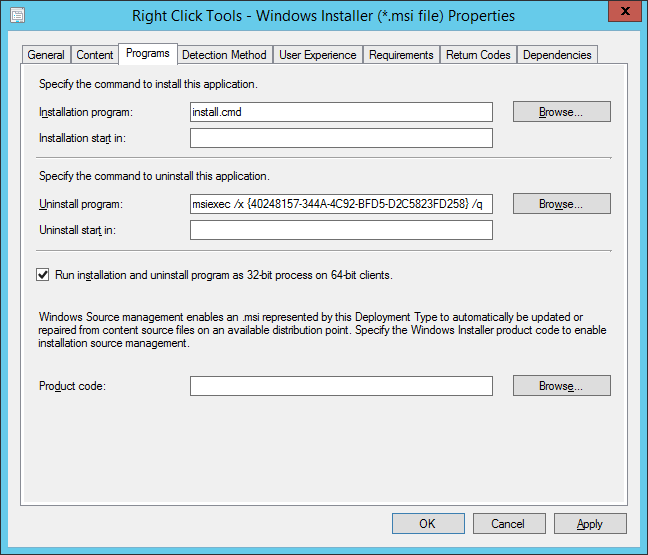 Since the Now Micro Right Click Tools are an MSI based installation, creation of the ConfigMgr applications is relatively straight-forward. 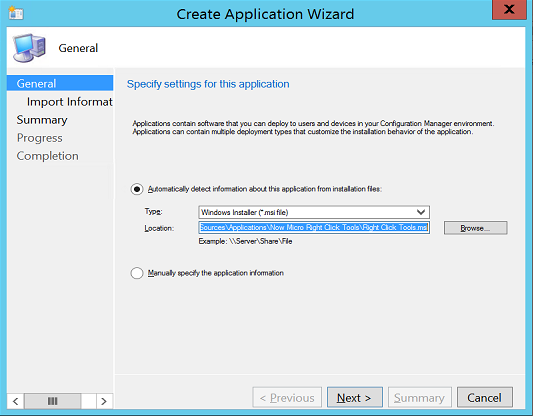 For simple deployments, the default installation will provide the full set of functionality of the Right Click Tools. 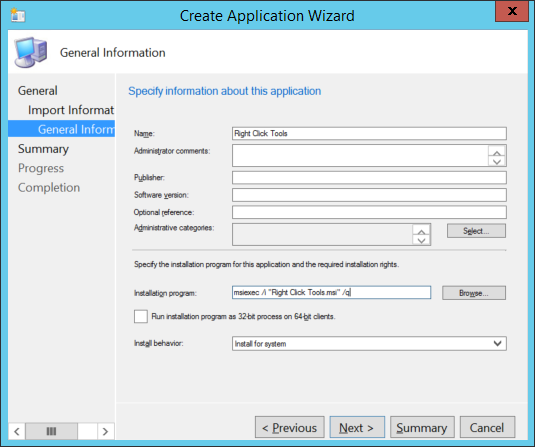 Before creating the application, download the latest version of the Right Click Tools from http://www.nowmicro.com/rct/ and copy it to a new folder in your ConfigMgr source folder. Next, right click on the Applications node and choose New Application. 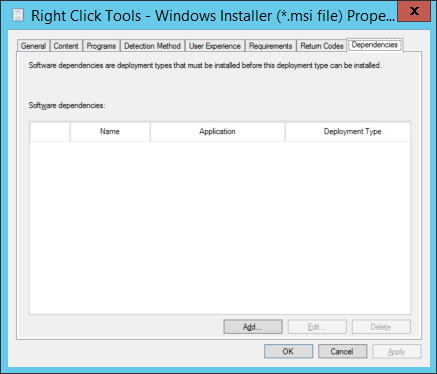 Use the Windows Installer type, and browse to the Right Click Tools.msi file in the ConfigMgr content source. The dependencies should look similar to this when finished. Once all of the customizations are made, copy the Default Menus folder up to the Right Click Tools install source and create a new .cmd file. Edit the .cmd file and place the following text. Replace the first line with the custom install string that was created as part of the Right Click Tools application. 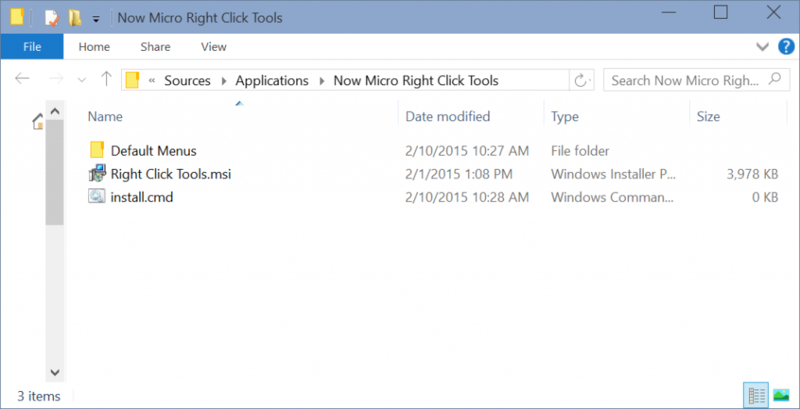 Next, go to the Properties of the Right Click Tools Deployment Type in ConfigMgr. On the Programs tab, change the Installation Program to the batch file created in the previous step. Check the box to “Run installation and uninstall program as 32-bit process on 64-bit clients” so that %ProgramFiles% maps to Program Files (x86) on 64-bit clients. Click OK to save the changes. Finally, update the content of the Deployment Type.